How do you get more responsibilities at work? Why would you want added responsibilities at work? It is safe to assume that the bigger responsibilities you get the higher your chances of getting a promotion and salary increase. After all, bosses do have higher responsibilities. You must be available for managers to hand you more responsibilities. Be there when people need you and go beyond that. Meaning, be willing to help out and actually be happy to have added responsibilities. To make yourself available, you need to ensure your schedule is properly managed allowing you time for these responsibilities. Thoroughness is very important at work. If you are someone who is very thorough you know you will be able to ensure the smooth workings of a project. Get into loving the nitty-gritty that it takes to finish work. While detail work is tedious, it allows you to understand the finer things that make certain processes work. Someone who is thorough will likely get bigger responsibilities. One way to get more responsibilities is to be decisive. Learn to make the best decisions with the given facts and situation, and move one. Otherwise, work will be stuck due to indecisiveness, constant meetings and bickering, and will only drain the people on the project. Once you have decided, be precise in your expectations. Otherwise, people who work with you will not know where you want them to go and what you want them to do. If you are able to combine dependability and resourcefulness you will get bigger responsibilities. The reason is that people who are dependable which means they can deliver what is promised may not be resourceful. To be resourceful means you know where to get help, how to secure collaboration, where to ‘steal’ time and be creative in solving your challenges. Added responsibilities go to those who can take initiative without being asked to do so. They know when to start doing things and they take the effort to start on things that they believe needs to be done. They do not need any reminders. People who are good with time will get more responsibilities. They can deliver on time. Besides that they are also punctual with meetings. Since time is a finite resource those who are good at managing it will get more responsibilities. No one person can finish the work himself. Good workers will always find ways to seek collaboration from others. They do so by connecting with people in an authentic way even when they do not work together. When the time comes for them to work together, it becomes an ease. To get more responsibilities you must be able to manage time. Then learn to be creative with your solutions. Seek collaboration, become available and be willing to help, and you will naturally be given bigger responsibilities at work. That way the way to a higher rank and better salary is within reach. Can I recommend this? 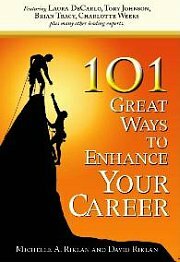 Invest in a copy of 101 Great Ways to Enhance Your Career. I am a contributing author together with the world's 100 other career experts. It will help you answer a lot of career questions you have and make a great gift for yourself or your colleague. Check it out here. You want to be a leader at work but you do not carry the title. So, how do you go about positioning yourself as a leader at work? Being excellent at work is something that can propel your career to higher plains. How have you tried to excel at your work? Being Responsible At Work – Is It My Job? Being responsible at work is one of the issues employers need to grapple. This is because far too many employees refuse to budge and take on what is deemed not to be their responsibility. How do you go about building credibility in the office? Well, you start by telling the truth. But isn’t that stupid? It depends on what you want. Honesty At Work – What Can Honesty Do For You? Honesty at work, is the thought too idealistic? Does honesty at work have a place ion our cut throat corporate world? The simple answer is, yes, there is. Here's why. How do you start being good at your job? Top on the list, stop creating excuses for your mediocrity and start creating reasons to excel. For more articles related to managing more responsibilities, click here. Your Career Success Story - Share with Us! Give us the details, so you can help motivate others to climb the corporate ladder, successfully.